The not so tiny, tiny home foundation. Build the long foundation for your new home with these Tiny House Trailer Plans. Build it at 32′ or 30′ length — Just one of many options in the plans. Or, if that’s too much, check out our 24′ TH Trailer Plans or the more compact 20′ TH trailer plans. 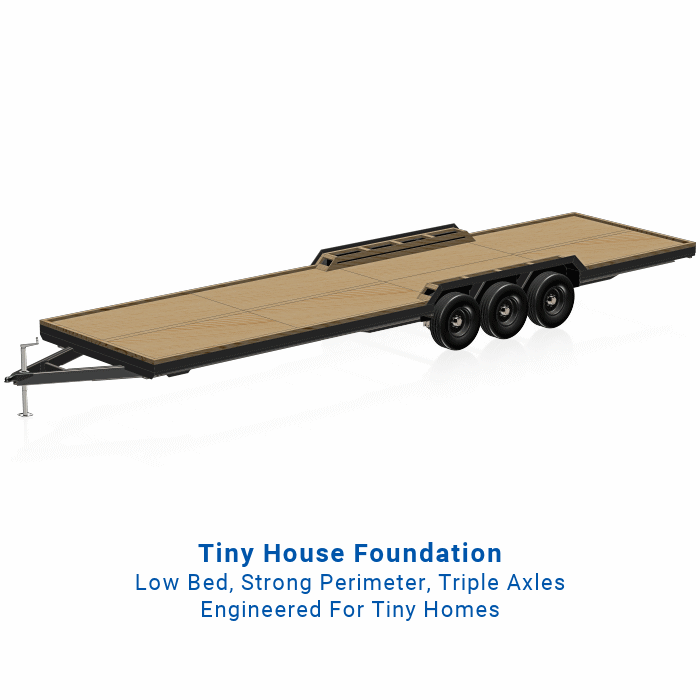 With 32 feet, tiny is not so tiny, yet these Tiny House Trailer Plans have focus specifically for building a home on. Build it to last a lifetime. High capacity triple axles for maximum support. 15,000+ lb. capacity. (With 18,000# option.) * Always better to have more capacity than you need. Optimized low floor for maximum headroom inside. Trailer frame is designed specifically for supporting load at the perimeter — where the tiny home outside walls carry the weight. 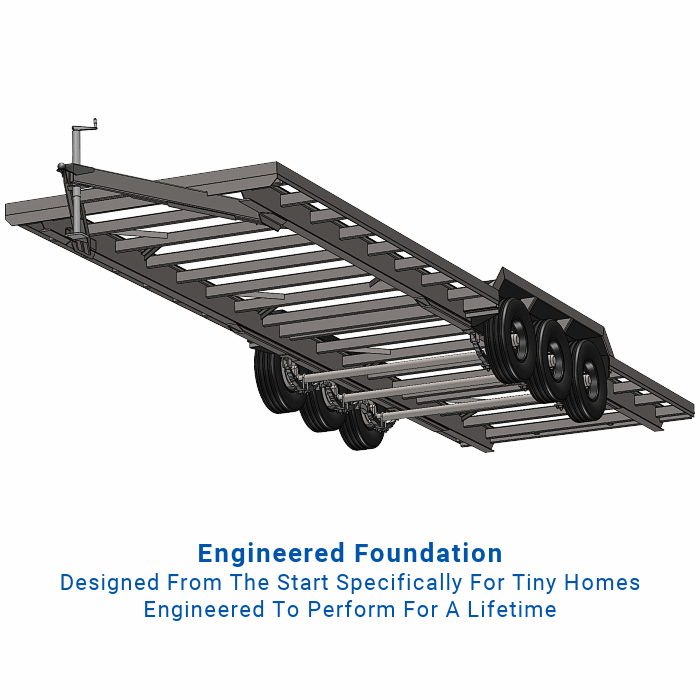 Special frame design makes for easier construction and integrated house floor. Many options are included in the tiny house trailer plans. Full detail drawings and illustrated instructions are available now for immediate download. The trailers at on Mechanical Elements are designed for the jobs intended. Since Tiny House trailer plans have unique needs, we designed these for the exact job. You requested a 30+ foot design, so that’s what we’ve delivered, and it was not easy to optimize for minimal deflection in a trailer this long. But, we like challenges, and in this case you benefit from the work. Read about the engineering in this Case Study at Synthesis. We have designed several one-of-a-kind specialty Tiny Home Trailer Plans (for individuals with specific needs). And, we’ve learned a lot about the importance of some of the features. Now, we’ve pulled them together in these plans (and our 24′ version and the shorter 20′ plans) so you get the engineering benefits without the custom trailer plans price! One frequent desire is a low deck (house floor) to enhance the interior headroom (within legal height limits). That is one great feature of these tiny house trailer plans, and it comes from careful engineering. Of course it has the option for drop axles, but we did a lot more. The floor integrates into the frame which saves vertical inches to maximize interior space, because tiny does have to not mean cramped. 20′ Trailer Analysis in this Image. The 32′ Frame Analysis is Similar. Engineering in these plans includes all we learn from other tiny home trailers. The frame is a solid foundation for your new house, including a cool construction technique to simplify building and help make everything straight and flat. But it’s even more. 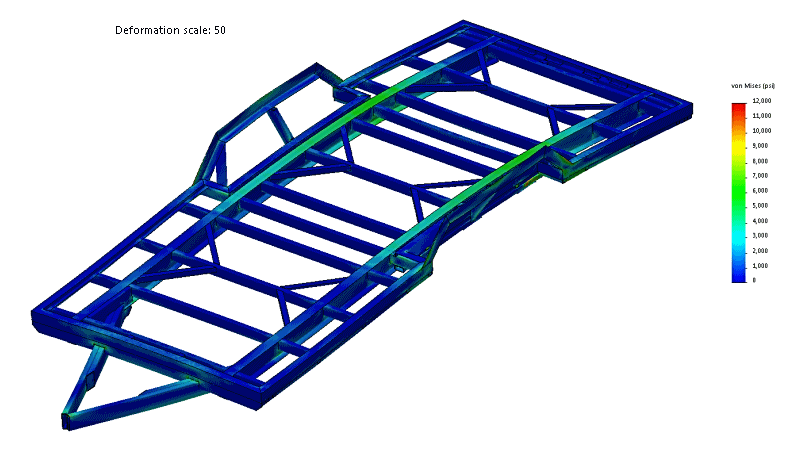 We use the great engineering tools like FEA (Finite Element Analysis) to back up our claims of “Stiff” and “Strong”. If you are ready for a new Tiny Home, this is the way to go. 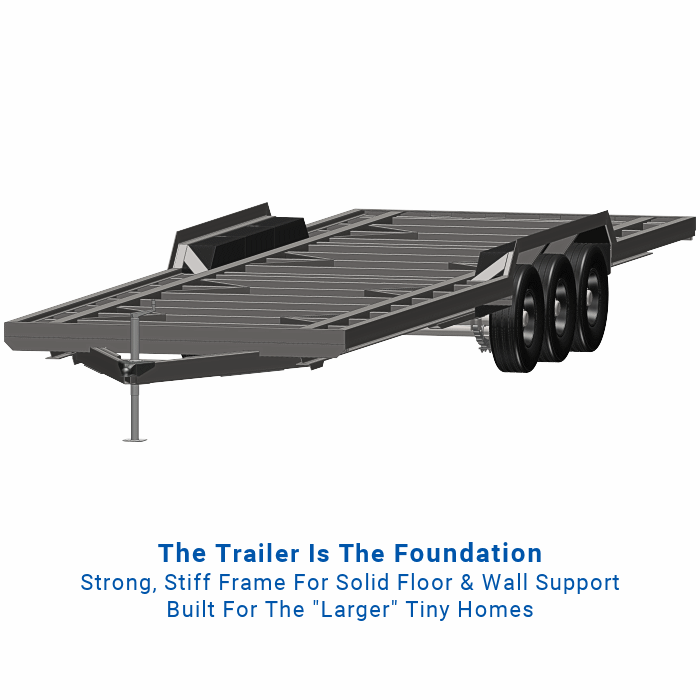 The trailer frame is 100″ wide so siding and edging can extend beyond the frame 1″ on either side. This hides the frame, while staying within the 8.5′ (102″) legal limit. Axle capacity is 15,000 lbs. (including the trailer). Plans also include an option for 18,000 lbs. total capacity. Design includes a perimeter ledge to support the walls. Anchoring is flexible to fit your unique floor plan and make building both easy and robust. Material selections are for strength and stiffness as are unique to a Tiny Home Foundation. I-Beams for the main loads; Rectangular Tube for crossmembers to resist frame twist; The floor and exterior walls bolt directly to the frame. 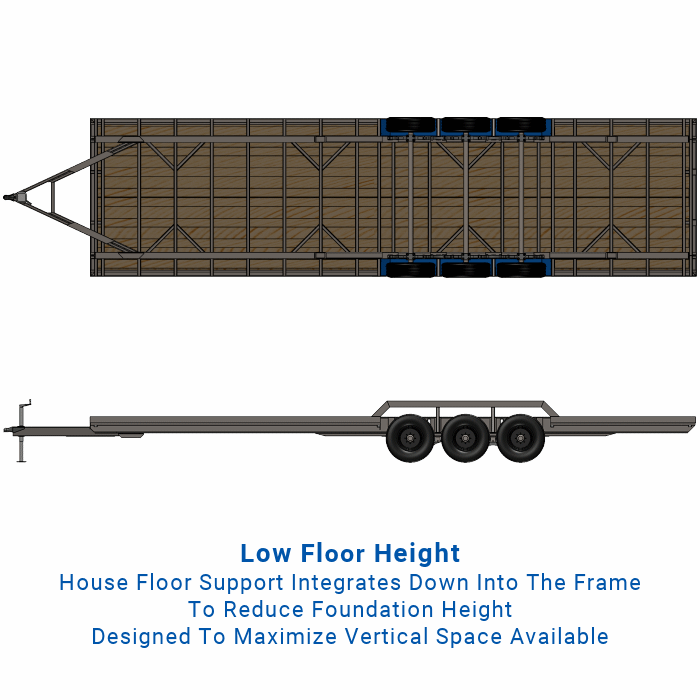 The house floor integrates down into the trailer frame to lower the floor and maximize head space. The integration of sides, walls, and flooring with the frame design allows maximum space for the house. All this because the trailer design is focus — from the first pencil stroke — as Tiny House Trailer Plans. No doubt, if you are looking for a sturdy Tiny Home Trailer as a Foundation for your new home, you’ve come to the right place. Mechanical Elements plans deserve a long look. Build it to last a lifetime – and more. Build it well, then it will serve you for many years to come. Order the plans above, then download immediately and start construction right away! The solid foundation from these Tiny House Trailer Plans is the first step to a fantastic new home.